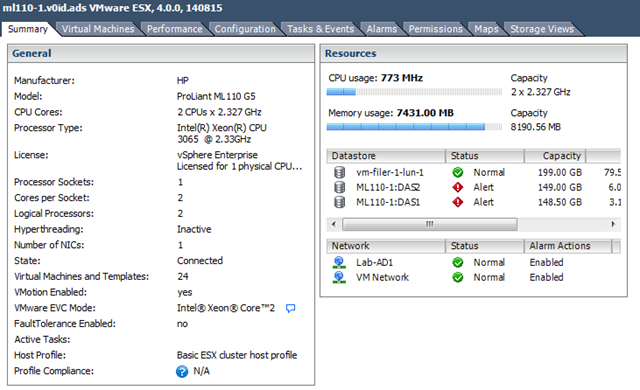 If you have a home lab setup or want to get going with learning VMware’s new vSphere product you will need an x64 capable machine to run it on, although it does also run under VMware Workstation too – even supporting nested VMs and physical ESX to virtual ESX vMotion! 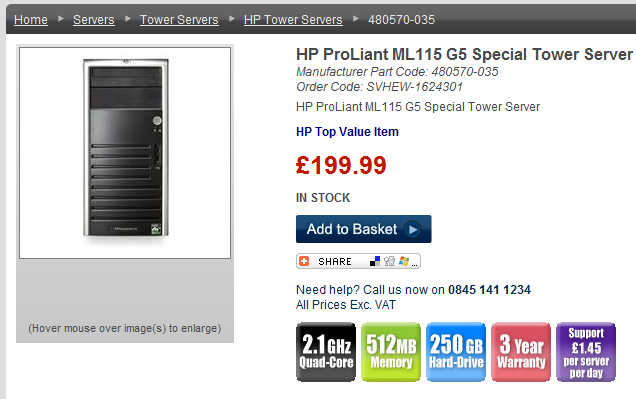 unfortunately it won’t run on my trusty old HP D530 desktops which I’ve used to run ESX 3.5 over the last year or so. 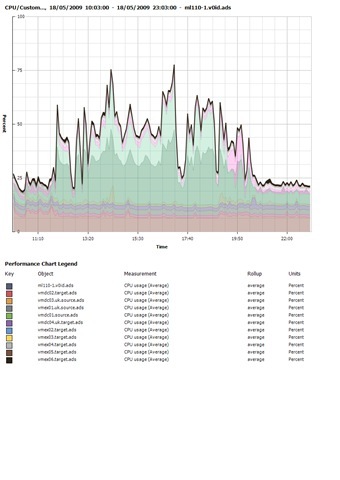 My lab setup uses a couple of HP ML110 servers, they are low-cost and pretty capable boxes, for example they both have 8Gb of RAM and cost me less than £350 GBP each with RAM and disks (although I’ve added storage from my spares pile). 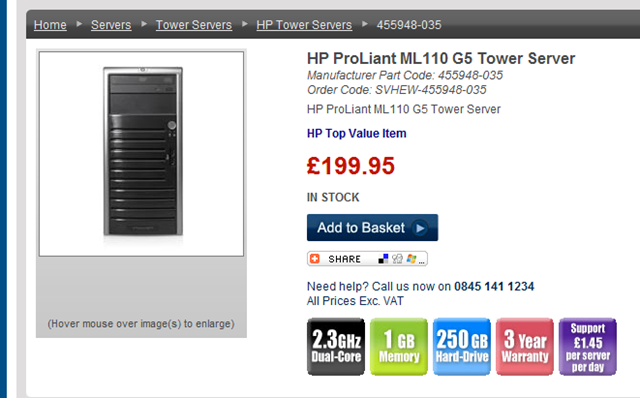 Linkage to Servers Plus £199 +VAT servers here (www.serversplus.com) if you tell them vinf.net or techhead.co.uk sent you they may cut you a deal on delivery as they have done in the past (no promises as I’ve not had a chance to speak to them). Check before you buy you can lookup the manufacturers part code to check with CPU each model has – or check with the supplier. UPDATE: the ML110G5 with the AMD Quad Core CPU IS VMware FT compatible – see link here for more details; I am ordering one now! 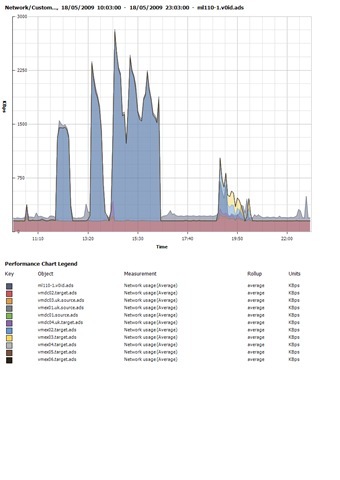 These are some general screengrabs, note there are lots of warnings showing – this is what happens when you thin-provision all your VM’s and then one fills up rapidly making the VMFS volume itself run out of space – you have been warned! 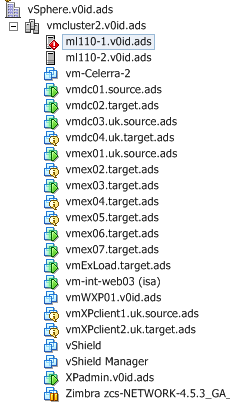 I’m running 15 VMs on one ML110, the 2nd box only has 1 VM on it as I wanted to see how far I could push one box, I’ve not found a real limit yet! 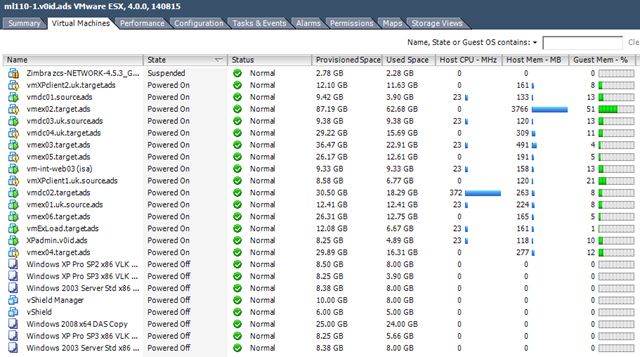 it runs a mix of Windows 2003/2008 virtual machines, and it doesn’t generally break a sweat – note the provisioned vs. used space columns – Thin Provisioning 🙂 and I’m also over-subscribing the RAM significantly. 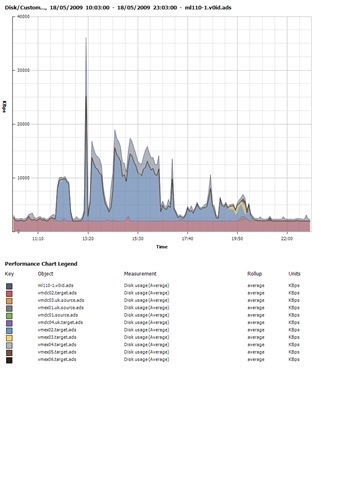 Interesting read.. I’m thinking of setting up a home ESX test lab.. Thinking the ML115 G5 would be a better option with FT compatible CPU..
One thing I was wondering is regarding the 60 day trial ESX licence.. what do you do at the end of that trial? reinstall? or can you replace the licence with a new 60 day one? Also for all your servers are you just using 30 day non-activated licences? How did you emulate 500 users? you can reinstall every 60 days, you’ll have to rebuild Virtual Centre though as you can’t easily reinstall it and get another 60 day trial, I am using the 60 day eval at the moment, but I do have access to NFR licences. Hi, yeah I thought that AMD would be ok.. not bad for a cheapy entry level chip. Good news that I can just reinstall.. I think I may have ways to apply for NFS licences so I may investigate that route.